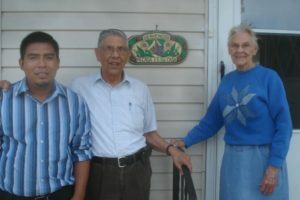 Raul and Vanita Tadeo were named the recipients of the Regional Journey Award for Everence Northeast Ohio. This award recognizes that the Tadeos, who live in Dalton, have given generously of their time and talents to help others in their community. The Tadeos have modeled hospitality by helping Hispanics, new to the area find jobs, housing, food, medical care, and translation services. They’ve also helped sort out immigration issues. They were instrumental in establishing Open Arms Hispanic Ministries, which is now a non-profit agency with a full-time director. “The Tadeos are truly an inspiring example of a couple who has lived a lifetime of stewardship that benefits others,” said James Frado, Managing Director for Northeast Ohio. The Tadeos attend Salem Mennonite Church in Wooster where they remain active. Raul is retired from being a pastor, and Vanita is retired from nursing. Both have worked in the mission field, primarily in Mexico.